Several years ago I met a woman who was married to a gentleman with a controlling personality. To say that he had his own way of doing things would be an understatement. The man, according to his wife, would give her instructions about how to do things on a daily basis. These included everything from the proper way to vacuum to the preferred method for turning the twist-tie on an open loaf of bread. I am not making this up. 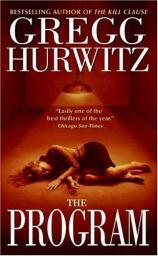 It was with foreknowledge of such individuals that I picked up THE PROGRAM by Gregg Hurwitz. Whatever chills had been raised by my acquaintance's account of her domestic situation returned with my reading of this harrowing tale of mind and behavioral control. THE PROGRAM, for the most part, is not awash in explosions and karate; Hurwitz is a dramatist, and a fine one. He is able to create more suspense and terror out of a few sentences of dialogue than many Hollywood film directors can with a two-hour celluloid canvas. Hurwitz's boogie man in THE PROGRAM is Terrance Donald Betters, known as The Teacher, who purports to run a behavioral institute that is, in practice, an extortion mill. When Leah Henning, a young college student with familial issues, falls under Betters's sway, her parents come to Tim Rackley for assistance. Rackley has been summarily drummed out of the U.S. Marshal's office for methods that, while brutally effective, are too over-the-top for a visible government agent. Will Henning, a Hollywood movie producer with friends in the highest of places, is able to get Rackley reinstated for the purpose of getting Leah away from Betters. Rackley, however, is nobody's puppet. When he goes underground to investigate Betters's program, he finds that Leah is a more sympathetic character than her stepfather and that, while Betters is a dangerous con artist, Leah may have had her reasons for seeking him out, even if those reasons were not good. Rackley insinuates himself deeply into Betters's organization in order to protect Leah and assist her in what will hopefully be a voluntary extrication. Doing so, however, puts Rackley personally and professionally in terrible danger. Isolated in every possible way, Rackley finds himself in the position of once again crossing the line that jeopardized his career once before. Hurwitz combines yeoman's research with his ever-developing writing abilities to create a first-rate tale. Cults range in size from Jim Jones's ill-fated Jonestown group to the infamous Manson family. THE PROGRAM gives the reader a front-row view of the personalities that lead, and follow, in such groups. This is a quietly terrifying work that will strongly resonate with any and all who read it.